I didn’t take a lot of in-progress shots of Rocky. (Longtime Beatles fan here, of course his name is Rocky.) 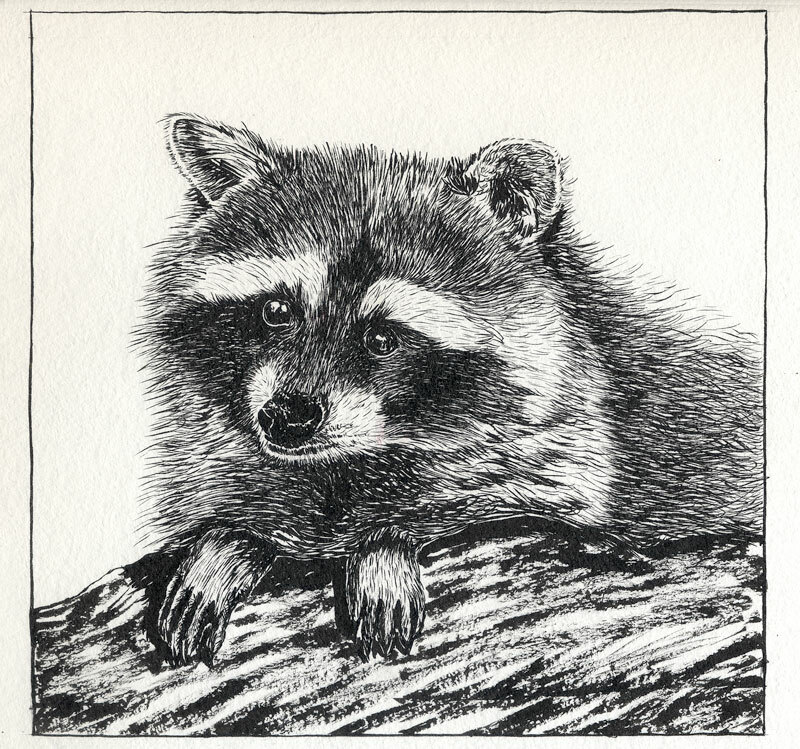 Mostly his features grew day-by-day from a pair of beady eyes, to a snout and a mask and eventually ears and body up to the edge of the rock that he’s hiding behind. I’d pretty much drawn everything there was to draw by the 29th, short of the rock itself to finish it off, when I had a brilliant idea. What if he had a paw up on the rock? I could see it in my mind’s eye. It would be so cute! It’s surprisingly hard to find a picture of a critter’s feet, in the exact shape necessary to make sense in another picture. I don’t know raccoon anatomy well enough to draw the feet without a ref, so finding something was a necessity. I finally thought I had one, but the paw was oriented the wrong way. Briefly considered just reversing it as I went along (which I can do quite fluidly) then thought better of it and copied/pasted the ref into Photoshop, and flipped it there. I also failed to cancel the original idea. So, a few minutes later I was happily reverse-drawing an an already-reversed raccoon foot, at not quite the right size and not in a place that made sense. It looked… horrible. OK, I can handle this… the thing that makes it look like a left-paw is the one toe that is curled. I drew in a straight toe next to it, added another paw for good measure, and covered up the unneeded toe with a big, black, juicy cast shadow. It ruined everything, and I knew it. The party I was drawing it for tried to brighten me up, but I could tell – it wasn’t working for him either. The drawing that that had both of us cheering all week was now an utter, total failure. My heart went through the floor, because if there’s anything better than really winning at a drawing, it’s winning at a drawing for someone you love who is cheering you on to a winning finish. That was all gone now. I did the only thing a sensible artist would do, and slunk off to my cave for a nap. Waking up, I started musing on the Azure Kingfisher lesson and the realities of opaque gouache. All didn’t have to be lost, really. Perhaps some of that opaque paint could be used to just cover up the entire mess, as it does, and replace it with the boulder that was always meant to be there. Another option was the little sample of Daniel Smith Watercolor Ground that had come with an order. It didn’t make a surface hold paint like paper did, that was for sure – but I didn’t need this to look like paper or traditional watercolor. Mixed media would be just fine. So would gouache on watercolor ground. Things were looking up, and I heaved myself out of the hammock for another try. Before I even had a chance to dig out the materials, the party in question had an even better suggestion. “Why don’t you just cover that all up with the mat?” Well, now we’re talking! The raccoon was still as cute as could be minus the boulder, and the section left showing was the part I was proud of anyway. It was a brilliant idea and I already had a mat that was just the right size and color. 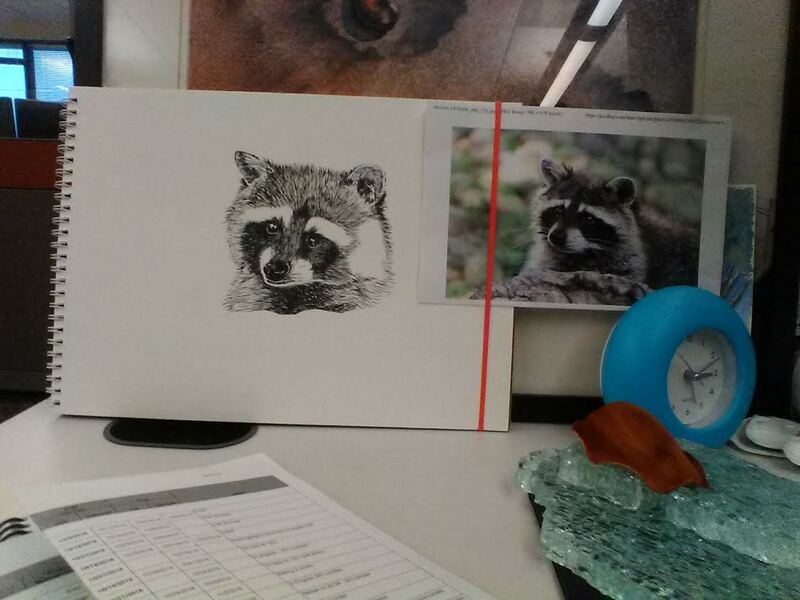 A few minutes later, he had a perfectly finished raccoon above his workstation, and I heaved a happy sigh of relief. Lesson learned: If you’re going to draw from a ref, get a pencil and some tracing paper involved before combining things. Better to work it up on a tissue overlay than to go through that again! After all that, you deserve to see him again! Bit of trivia about Rocky: other than meeting doodles, this is probably the first art I’ve done in 5+ years that does not have a speck of watercolor paint on it. He is 99% pure ink with just a few swipes of Bleedproof White for his whiskers. 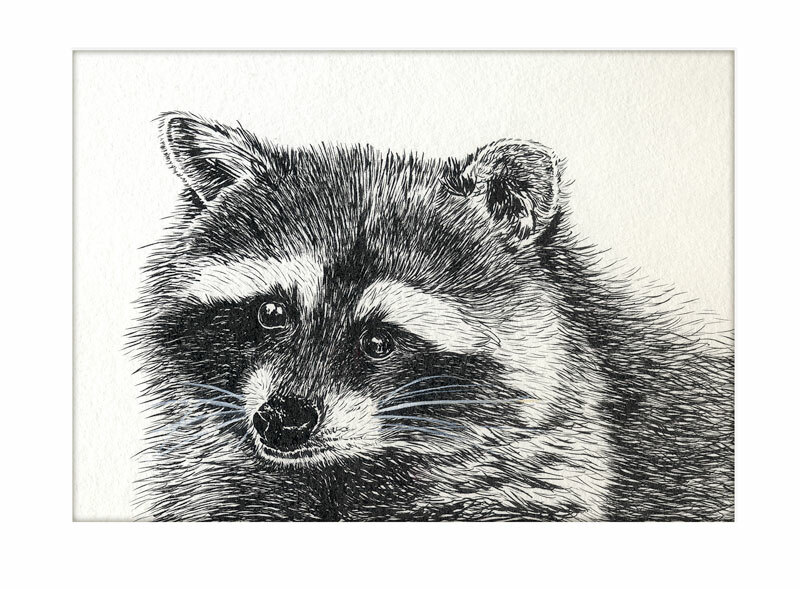 The mat opening is 5″ x 7″ and every single one of those hairs was drawn with the Kuretake #40.